William Harald-Wong is an urban identity designer, working at the intersection of brand, culture, city and community. He collaborates widely with architects and consultants on cultural research, wayfinding, signage, environmental graphics and place-making; infusing a distinctive Asian/Southeast Asian aesthetic to the projects where relevant, and enhancing the human and cultural experience of a place. He is the Co-Founder and Chairman of The Design Alliance Asia, a collaborative network of prominent designers across 13 countries/regions. Portraits of key presenters at Visualogue, Icograda International Design Congress 2003, were projected on the interior wall of the Nagoya Congress Centre, Japan. William led The Design Alliance Asia to a three-and-a-half-hour presentation, AsiaBeat—A Clash of Signs and Symbols, covering visual ideas from ten Asian countries. The Design for Asia Awards 2015 was the first design competition our company has entered since the mid-80s. The Design for Asia Awards 2014, on the other hand, was the first and only submission to a competition to date by The Design Alliance Asia. Awarded for the studio’s work for Muzium Sultan Abu Bakar, Pekan, Malaysia. Malaysia’s first Gold Award as well as Grand Award Finalist in the prestigious competition’s 12-year history. The museum scored with an identity that imparts a strong sense of place and purpose, local history and community values. Receiving the Award with Dato’ Ahmad Farid (left), Director and Chief Curator of Muzium Sultan Abu Bakar. Awarded for Colours of Asia, a research project covering 13 Asian regions. The project comprised a number of planned events, including an exhibition, student workshop, forum, seminar, publication and a 650-page research paper. A project by The Design Alliance Asia, curated by Prof Ahn Sang-soo and William Harald-Wong. Award presented at Putrajaya, the administrative centre of the Malaysian Government, in recognition of William's contribution to the creative communities of China and Hong Kong. Awarded in recognition of William’s contribution to the creative and business communities in Asia as Co-Founder and Chairman of The Design Alliance Asia, and former Vice-President of Icograda (now known as ico-D, International Council of Design). The Award by DDEC (Design Development Centre, Kuala Lumpur) recognises outstanding creative talent across all disciplines as they put Malaysia on the world’s creative map. To date (2018), only two Lifetime Achievement Awards have been given out—the first to Dato’ Johan Ariff, a pioneer designer for corporate Malaysia in the 70s and 80s; and the second to William Harald-Wong. An interior / architecture award, William was selected in recognition of his contribution to the creative industry of Mainland China. Awarded by the Construction Industry Sub-Council of China Council for the Promotion of International Trade and Qinghua University Fine Arts College. Supported by China Building Decoration Association and Architectural Society of China. The following section documents William’s engagements with the design community in different parts of the world. Written partly as a blog, he shares some insights and personal perspective on people and place. The final section lists his talks from 1994 to the present day. William served as Vice-President of icograda from 2001 to 2003. Founded in London in 1963, the organisation, renamed ico-D (International Council of Design), is a non-governmental international voice for design. “Sometimes things got messy, but it did the work. David Grossman (pictured) was Past President then—we met again 16 years later in Kuala Lumpur at the ico-D ASEAN Regional Meeting 2018”. Photo / icograda Board meeting in Beijing 2002. “I had to attend four Board meetings in a year, each time held in a different continent; and whenever possible, our members’ design events in some parts of the world as well. It was especially tough when I did not get any government or institutional financial support, and had to run my company at the same time. But the networking and friendships developed over the years were invaluable”. Photo / Board members at Beijing airport, always designing on the run. 2002. Photo / The Red Cross International Poster Exhibition was one of many events we officiated in China. 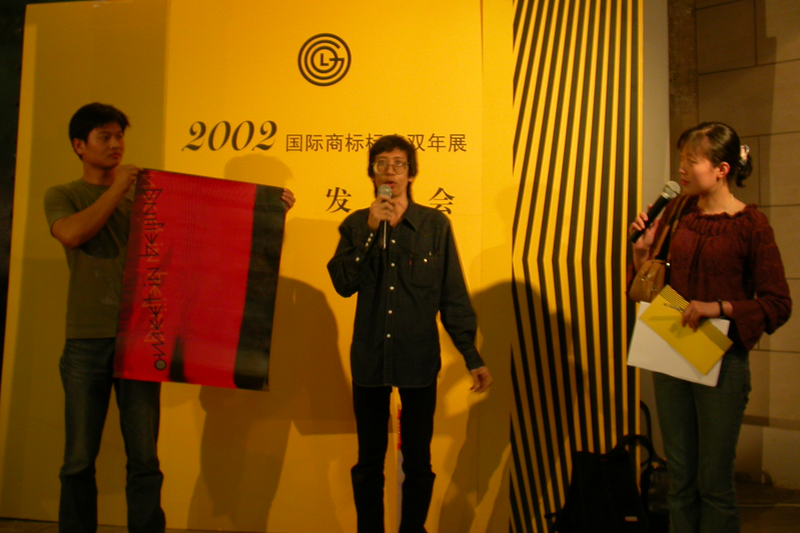 Beijing, 2002.
icograda was the first international design / visual communication organisation invited to China, bringing together various Chinese design stakeholders for a dialogue on international collaboration. William gave lectures in Beijing and Shanghai, and visited Tsinghua University and the Central Academy of Fine Arts (CAFA). Photo / (Left) One of several Beijing Olympic sculptures installed around the campus of Tsinghua University—this was six years before the Games; (right) Poster for icograda Design Perspectives Seminar in Beijing. William’s posters for the Beijing Olympics 2008 and Mata Samseng were auctioned in Shanghai to raise funds for the local design association. 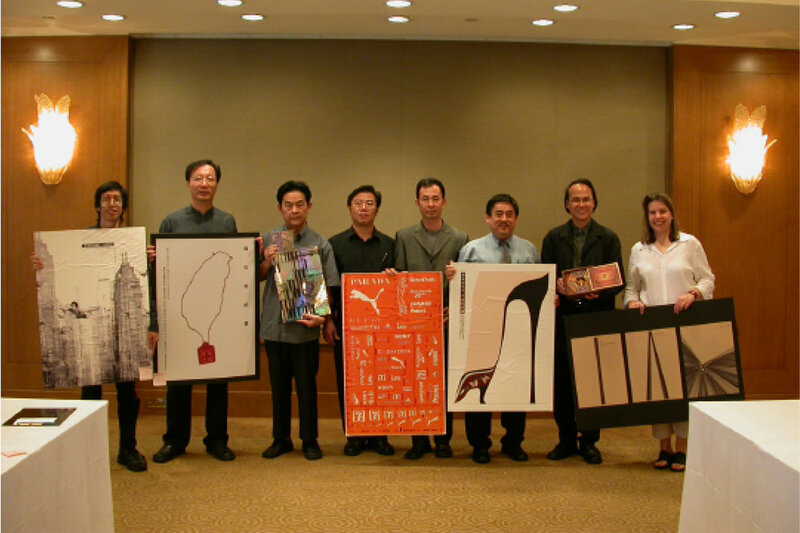 Among various speaking engagements in Mainland China, William was invited to design a poster (titled Better Home City, Better Life) to celebrate the Shanghai World Expo 2010. The design was transferred to a commemorative mug sold by registered World Expo retailers. Photo / Exhibition at the Fine Art College of Shanghai University and at The Bridge 8 creative industries hub. “I don’t recall where I first met Mr Huangli, the publisher of China’s influential Package & Design Magazine, but we kept in contact for over 17 years. 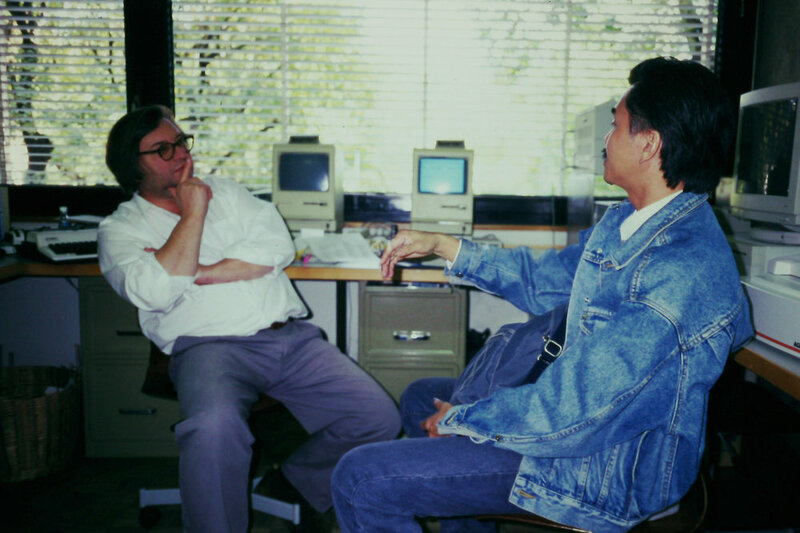 Photo / Huangli (in black t-shirt with some motifs on the front) at our studio in 2001. William’s studio has welcomed many visiting designers from around the world as well as student interns from the UK, US, Canada, Brazil, Netherlands, Germany, India, South Korea, Vietnam, Singapore (and several more). “I wish to thank each and everyone for their lively exchanges with our designers”. Photo / Huangli returns with 24 creatives from Mainland China, 2017. From 2003 onwards, William devoted more of his time to design activities in Hong Kong. He also focused on expanding an organisation he co-founded, The Design Alliance Asia. William finally returned to Mainland China in 2017 when he was invited to witness the Opening Ceremony of Tianjin’s Asia Design Centre, as well as to serve on the panel of judges for the 2017 TEDA Cup International Youth Design Competition. 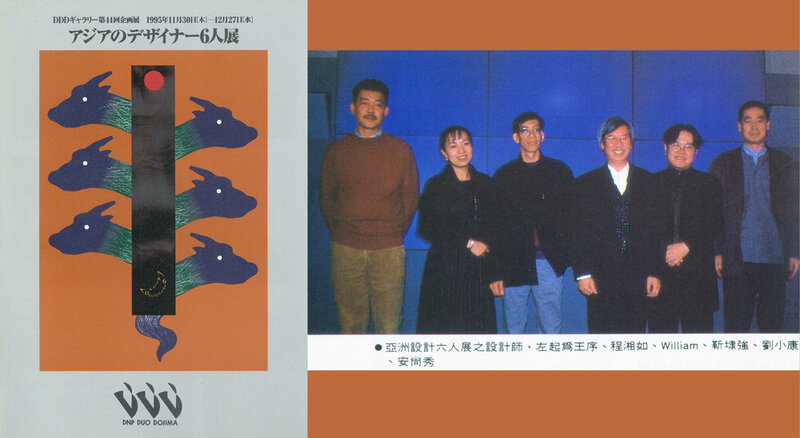 Photo / (Left) Kan Tai-keung’s Retrospective exhibition at Hong Kong Design Institute; (Right) Looking at one of the company’s early promotional piece. 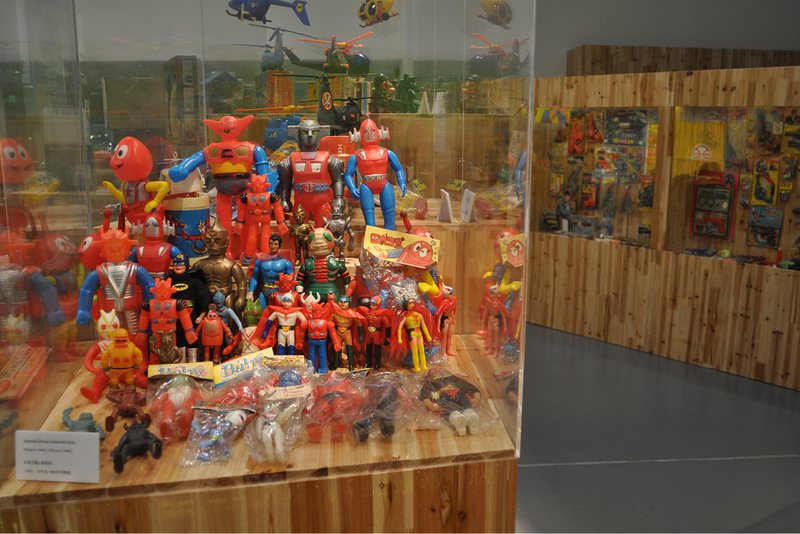 Photo / Toys Paradise—Creativity and Toy Culture of Hong Kong at Hong Kong Design Institute, 2002. William’s first trip to Hong Kong as a speaker was for the Hong Kong International Poster Triennial 2001 Symposium held at the Hong Kong Heritage Museum. His posters, which were exhibited at the Symposium, were added to the Permanent Collection of the Museum. In 2006, he was invited to join the panel of jurors for the Design for Asia (DFA) Awards, which then initiated a long working relationship with the Hong Kong Design Centre (HKDC). Photo / DFA Awards 2006 and below, 2017. William served on the panel of jurors for the Design for Asia (DFA) Awards in 2006, 2008, 2010, 2013, 2014, 2015, 2017 (photo) and 2018. 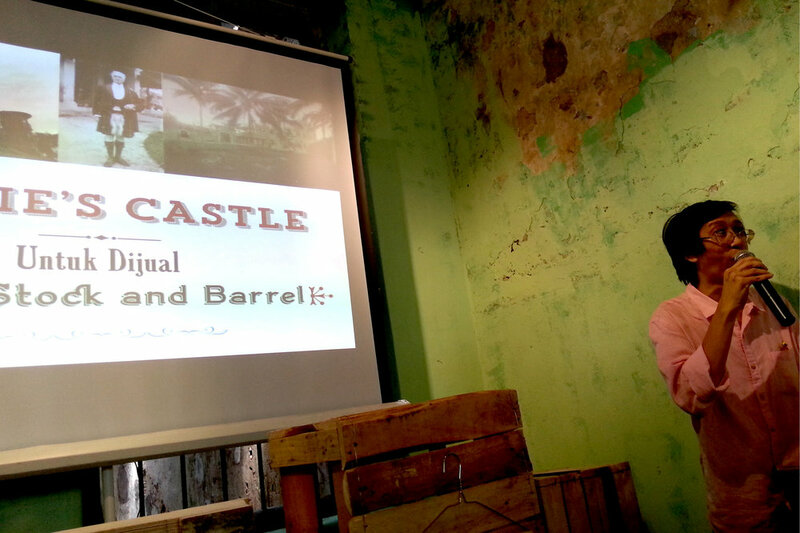 William was a speaker at the Business of Design Week in 2015 (Title of talk: Muzium Sultan Abu Bakar), 2012 (Packaging for the Malay-Muslim Market) and 2004 (The Disciplined Congee). Either William or one of his associates at tDA Asia would make it a point to attend the annual Global Design Network (GDN) symposium, which promotes the advancement of the design industry on an international level. The symposium also encourage multidisciplinary cooperation between the design and business sectors across nations. Note: Before computers found their way into the design studio, photographic prints (‘bromides’) of lettering had to be cut and pasted on a plastic overlay [in the above photo (right, the plastic has turned yellowish with time]. This overlay was then moved into position so that the hand-drawn registration marks on the paper and plastic overlay aligned. A surprise invitation from Japan led to William’s first exhibition outside his home country, Malaysia. This was the Six Asian Designers exhibition, held at DDD Gallery in Osaka. 6 Asian Designers turned out to be a life-changing event for William as the exhibition connected him to North Asia’s most influential designers. Five years later, Prof. Dr. Kan Tai-keung, Freeman Lau, and later, Prof. Ahn Sang-soo accepted his invitation to be Founding Associates of the Design Alliance (tDA). Photo / tDA Asia at Visualogue, Osaka, 2003. William participated in the Global Exhibition: Duo Posters by 33 Designers from around the World held at GGG Gallery, Tokyo and DDD Gallery, Osaka. 33 leading designers were invited from Australia, Canada, China, Hong Kong, England, Finland, France, Germany, South Korea, Malaysia, Mexico, Portugal, Spain, Switzerland, Taiwan, and USA to create original works to commemorate the sixth anniversary of the DNP Duo Dojima (DDD) Gallery. 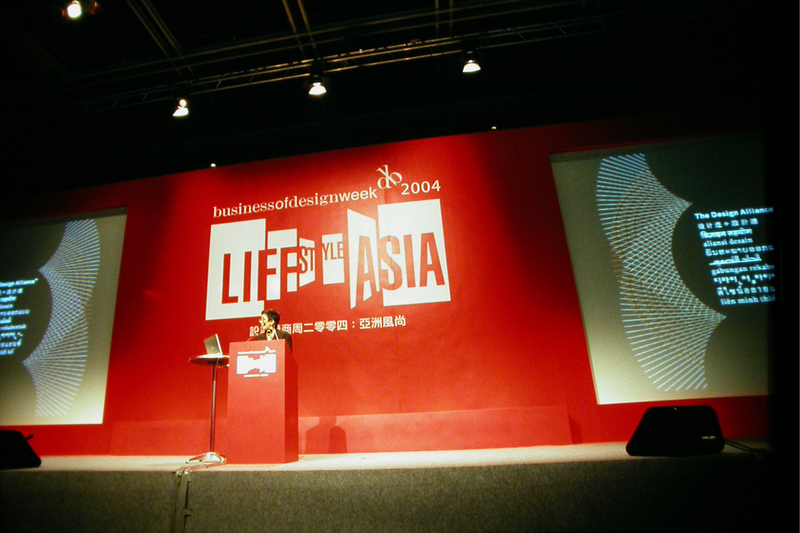 tDA Asia, representing ten member countries in 2003, presented AsiaBeat—A Clash of Signs and Symbols, a visual feast of Asia’s design culture, at Visualogue, icograda International Design Congress, Osaka. William declined re-election as a Board Member of icograda at the General Assembly in Nagoya to focus his attention on his new organisation, the Design Alliance Asia. Photo / Sayonara... Delegates of icograda member associations from around the world at the General Assembly. After a hectic one-week icograda programme in Beijing, Shanghai and Suzhou, William arrived in Taipei with Board members to preside over the first icograda Asian Regional Meeting. Professor Apex Pang-soong Lin was awarded the icograda Design Achievement Award for his role as “Taiwan Design Mentor”. As a designer and educator, he had created a conducive environment for the advancement of designers—not only in Taiwan, but around the world. William returned to Kaohsiung, Taiwan, in 2003 with associates of The Design Alliance Asia for a student workshop and seminar. This was followed by Taipei (2006), Taichung (2015), Tainan (2016) and Taipei (2017). Between 2006 and 2015, William became more involved with Hong Kong. tDA Asia associates and the late Japanese design master, Shigeo Fukuda were invited to contribute an image for the public park at the Kaohsiung Cultural Centre. Photo / The images were illuminated at night and glowed like lanterns along the main road. 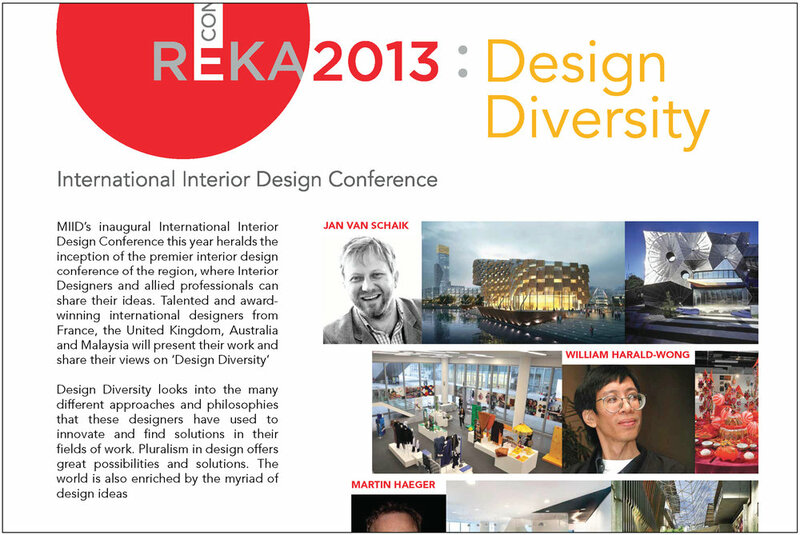 William spoke at the International Conference on Visual Design. The invited speakers also exhibited their work at the Taiwan University of Fine Arts. Photo / Prof Apex welcoming speakers from five countries for the TISDC International Design Masters Lecture Series. “Just as we sat down for dinner at the (near) top of Taipei 101, one of the world’s tallest building, another earthquake hits Taiwan. The timing was perfect. “From our location, we were only able to tell that there was an earthquake through a slight shaking of the chandeliers and the agitated reflection of their lights on the walls. Otherwise, the floor and furniture remained surprisingly still. Photo / Image taken at the very top of Taipei 101 before the earthquake struck. In 2016, Taiwan began to actively promote the Taiwan International Student Design Competition (TISDC) and Golden Pin Design Award in Southeast Asia. William, industrial designer Rock Wang, and architect Kristof Crolla were invited as the speakers of the first Design Perspectives x Golden Pin Salon 2017 in Kuala Lumpur. William represented tDA Asia at the Global Talent Design Festival (GTDF), organised jointly by the iSee Taiwan Foundation and the Sayling Wen Cultural and Educational Foundation. The GTDF comprised a series of events: the Global Talent Design Workshop, the Global Design Leadership Forum, and the 1st World Summit of Design Organisations, attended by representatives from 21 design organisations from around the world. During the GTDF, William presented The Design Alliance Asia Prize to the winning team from Taiwan at the TISDC Awards Ceremony in Taipei. TISDC received 18,932 entries from 910 design colleges and universities in 71 countries/regions. Photo / With Freeman Lau next to ‘Fundamental’, an animated work that won the tDA Asia Prize (bottom of panel). “In the 1980s, before the advent of the Internet, many local designers of my generation grew up with American advertising and graphic design, mainly through US magazines (e.g. Print and Communication Arts), and later Creative Review from UK, as well as Idea from Japan. There was scant information on European design. In the 90s, armed with the names of prominent European designers that I had collected from various sources, I left for London, Netherlands and Paris. Upon arrival, l headed to phone booths to look up their addresses, and then proceeded to knock on their doors—all cold calls. *most of them knew Singapore and Thailand, have heard of Malaysia but did not know where it was. Photo by Lex van Pieterson / New identity for the Dutch Police, 1993. As a reciprocal gesture, William invited Gert Dumbar as Chief Judge for Shriro Paper’s Horseman Awards in Malaysia and Singapore, and a lecture in Indonesia (with Anthon Beeke and Li Edelkoort). Michel de Boer, former Creative Director (and later co-owner) of Studio Dumbar, later became one of our associates. William’s first lecture in Europe was at Einhoven, Netherlands, followed by Paris (1996). His last working trip to Continental Europe during the mid-90s/early 2000s was for an icograda Board Meeting and Student Workshop in Brno, Czech Republic (2002). Thereafter, he turned his attention to Asia and did not return to Europe for professional design engagement until 14 years later, in 2016. Photo / Student workshop in Brno. William has had a long association and attachment to Britain: work, conferences (ATypl at Reading University), research (museums), books (in the 90s, some of the best books in English on Asian culture could be found in London), and a place to experience cutting-edge design. His last trip to UK in the mid-90s/early 2000s was for the Arts in Business: Business in Arts UK study tour, sponsored by The British Council (2002). 16 years later, he returned to London as a juror for Design Crafts, D&AD Awards. “I was urgently despatched to Qatar (with designers Adil and Hadi) to help spruce up the image of several companies from Terengganu, Malaysia, that will be participating in a trade exhibition in Doha within a few days. If that sounded like an emergency, that’s because it was one. “Upon arrival, I discovered that only a few companies had proper presentation visuals. The rest were small producers with poor packaging and visual boards that looked amateurish (although this was not indicative of the quality of their products). “We scoured Doha for basic art supplies, and then holed up in Sheraton Hotel the next two days to create handmade posters, information boards and some decorative items. 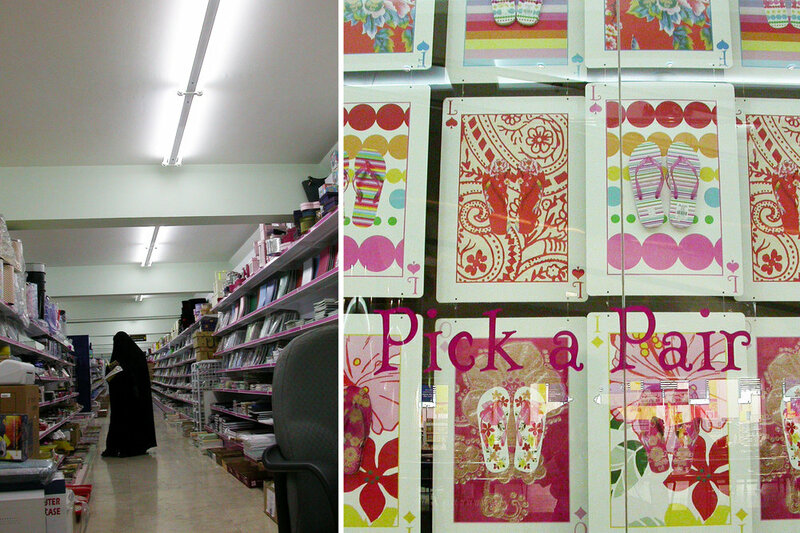 Photo / (Left) The stationery shop in Doha that saved the image of some Malaysian companies; (Right) Window graphics for a local shop selling flip-flops. Photo / Doha in 2003. Photo / Doha in 2018. Arrows indicate the location of the two buildings featured in the previous photograph. In 2006, William established an associateship with Reda Sijiny and Mohammed N. Al Sharif of urbanphenomena, a multidisciplinary practice based in Jeddah. A recent collaboration between WHW & Associates and urbanphenomena was for the wayfinding and signage programme for the Business Quarter (BQ) in Dammam. William delivered the keynote address, Design in Multicultural Societies, at the DEFSA International Design Education Conference held at the Museum Africa in Johannesburg. He attended the Sappi Continental Shift International Design Congress in Sandton City as an icograda Board Member, and was requested to replace an absent speaker at the eleventh hour. Photo / Flickr Creative Commons, Martijn Munneke / Patterns from Congress Guide Book. 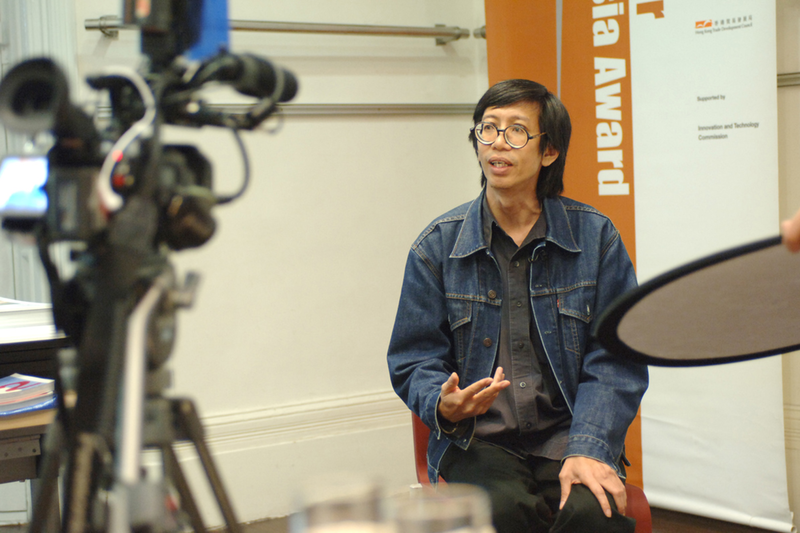 William’s first presentation in Australia, titled Graphic Design at the Cultural Crossroads of Southeast Asia, was at the Sydney Design 99 International Design Congress, followed by a talk at Gallery 4A—both in Sydney (1999). This was followed by talks in Perth (2000) and Melbourne (2001). William returned to Australia nine years later on an invitation to speak at Optimism icograda Design Week in Brisbane. Photo / Detail of poster for Optimism by Studio Pip and Co.
William was invited by Yeoh GH and Prof Hazel Gamec to Wanganui School of Design in New Zealand to give a talk at the School’s UNLEADED Design Camp. Photo / Student workshop presentations—students were tasked to explore ways of presenting the letters 'UNLEADED’. This team used fire to form each letter of the word. It is always a pleasure to meet up with fellow Malaysian students studying and living far from home. After his first group exhibition in Japan in 1995, William began to give talks overseas, either by invitation or with the generous support of Arjowiggins/Shriro Paper, which organised lecture talks for him in Malaysia, Thailand, Vietnam, Laos and India. In the late 90s, both (the late) Nick Mason of Arjowiggins and FC Wong of Shriro Paper played a key role in raising the standards of local design by supporting designers and students. Pertubuhan Wakaf Reka Grafik Malaysia (wREGA) or Graphic Design Association of Malaysia was founded on 1 July 2001. The Founding (Protemp) Members were William (President), Melisa Wong (Deputy President), Ezra Rahim (Vice President), Abdul Hanan Ahmad (Secretary), Koh Lee Meng (Treasurer), and Committee Members Ben Chua and Asri Ahmad. Photo / With Prof Ahn Sang-soo, who was in Malaysia to promote the icograda Oullim conference. Through the years, William have had good relations with the interior design association, giving talks and serving on the panel of jurors to provide a branding perspective. At the MEX (Magazine Exhibition) Forum at the official opening of the Georgetown Art Festival. William has given many lectures at art and design colleges and conferences in Malaysia, including the Malaysian Masters Series (KL Design Week) and Reka Negaraku. A full list of lectures appears at the end of this page. In 1995, William was paired with Henry Steiner (Hong Kong) for a workshop organised by The Asia Business Forum. William’s talks in Singapore include the Temasek Design School (1999), International Design Forum (2000) and NTU (2012). His other engagements in Singapore were with tDA Asia. 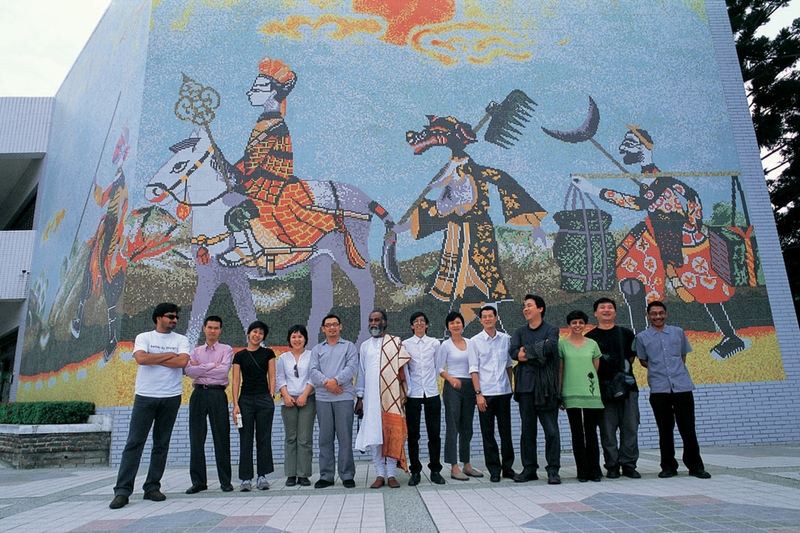 Photo / With students of Temasek Design School, 1999. William spoke on Collaborative Networks in the Marketplace of Creative Arts, a programme of WIEF, which brings together artists of the Islamic World. Photo / Lecture Slide—Intercultural spaces, its potential—Designer Ena Hadzir working on her 3D model, WHW Studio. Photo / Poster given away to students during the Conqueror Design Lectures in Penang and Kuala Lumpur 1996. William’s early visual research covered Kuala Lumpur (where he worked), the small towns of Peninsula Malaysia, as well as Jogjakarta, Solo and Bali. It was in Bali—during the mid-90s, still largely authentic before mass tourism overwhelmed the island—where he was given the opportunity to do his first documentary project for a client. In 2006, William was invited by the Indonesia for the World consortium, along with tDA associates from Singapore and Thailand, to advise on a national initiative to create world-class export products through strategic design. 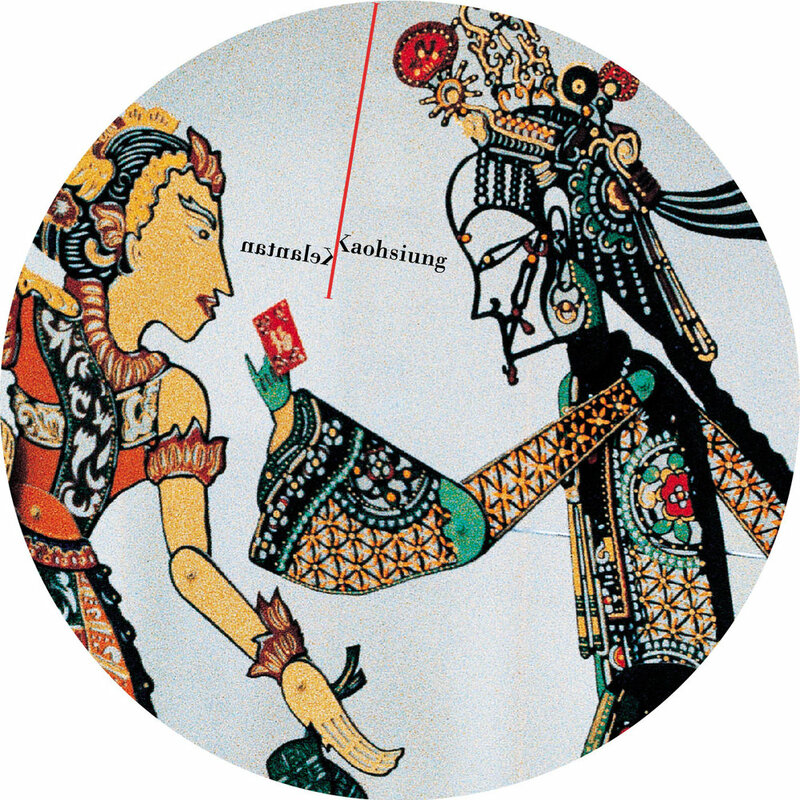 Thus began William’s engagement with the Indonesian design community in Jakarta and Bandung. Photo / Outline of Indonesia’s Design Road Map 2006–2010 by Her Excellency Dr Mari Elka Pangestu, Minister of Trade. William gave a talk on brand authenticity. William tDA associate, Punlarp Punnotok (Thailand), led a workshop with the aim of repackaging local food items to meet modern export requirements, but without losing their unique visual appeal. Photo / With Prof Nezar AlSayyad, whom we met at the Arte-polis 3 International Conference earlier in the day. Photo / Ridwan’s collection of miniature chairs at his home. He mentioned to us in passing that he wanted to run for public office, and three years later, he was elected Mayor of Bandung. 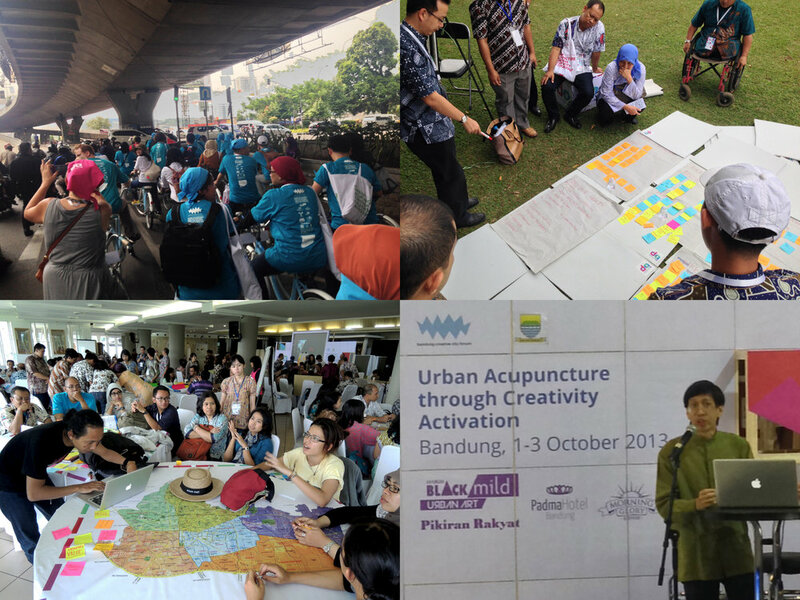 William was invited to give an introductory speech at a 3-day workshop aimed at alleviating Bandung’s infamous traffic jams, focusing on new, alternative routes (via bicycles) to get from point to point. tDA India associate, Ashwini Deshpande, presented a case study of Elephant Design’s efforts to improve Pune’s bus transportation system and to change the perception that only the poor take the bus. William gave a talk, titled Culture, Nature and Designing for Change, at the 3rd International Conference of Bandung Creative Movement with the theme Multidisciplinary Design: Harmonizing design in today’s society, technology and business.